Musician Mark Greathouse and his wife, Prague-born singer/dancer Helena Greathouse, form an artistic pair known collectively as “The Greathouse of Music.” This is the second volume the couple has produced of dances, accompanied by original musical compositions for the piano. This second volume features the choreography of Czech Republic-based Elena Kameníková, transcribed and translated into English by Helena Greathouse. 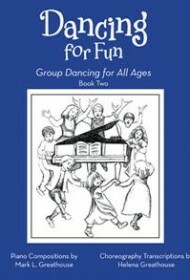 This second volume features ten dances for small groups. The dances are more involved than those in the first volume and they presuppose a knowledge of the terminology of formal dance. However, the authors have included a helpful glossary of terms to aid rusty memories. Overall, the Greathouses are producing a charming body of minor work in music and dance. This second collection of their work offers a good starting point for the dance beginner who wishes to take his or her skills to the next level.